Is It True That Only Six People Died In The Great Fire? Nick Young Is It True That Only Six People Died In The Great Fire? 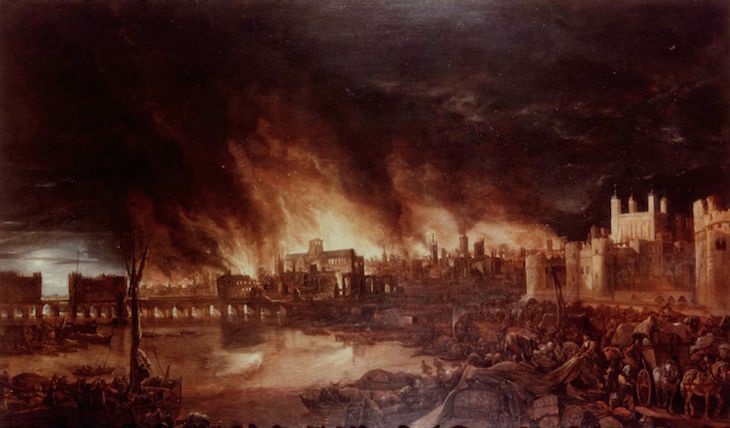 For a fire that destroyed some four-fifths of London — including 89 churches, four of the City’s seven gates, around 13,200 houses and St Paul’s Cathedral — one remarkable aspect of the Great Fire of 1666 is the death toll. According to the official records, just six people died in the disaster. "Merciless to the wealth and estates of the citizens, it was harmless to their lives," according to the inscription on the Monument. According to records, the first person to die in the Great Fire was a maid employed by Thomas Farriner, a baker in whose Pudding Lane establishment the fire began. While Farriner, his daughter and a manservant were able to escape the blaze, the unnamed maid was not. Another victim was Paul Lowell, an elderly Shoe Lane watchmaker whose remains were later found in his house. In the parish of St Mary Woolnoth, the body of one Richard Yrde was found in a privy where he was overcome by smoke. The burnt corpse of an unnamed old woman was found near St Paul’s, and three bodies were found inside the cathedral itself, mummified by the heat; those who found them were unsure whether they were victims of the fire who had sought refuge in the cathedral or remarkably well-preserved bodies that had lain there for centuries (which sounds unlikely, but one was claimed to be that of a man who had died in 1404). Can such an enormous blaze have only killed six people? What the traditional death toll does not take into account is those whose deaths were indirectly caused by the Great Fire, and there is evidence for a few of these. A woman suspected of being an arsonist was murdered by an angry mob in Moorfields. A man is supposed to have dropped dead from fright on Tower Hill while watching the blaze. A few people are said to have been killed afterwards, when weakened floors gave way while they were searching through their ruined homes. James Shirley, a playwright, had fled his Fleet Street home along with his wife and taken shelter in a makeshift refugee camp in St Giles-in-the-Fields; living in the open in the cold weather that followed, both fell ill and died. To this sad and surprisingly short list must be added Robert Hubert, a French watchmaker who (somewhat unconvincingly, it must be said) confessed to starting the fire and was hanged at Tyburn. Given the scale of anti-French and anti-Catholic feeling and the resulting need on the part of the authorities to find a convenient scapegoat, it’s possible that his confession was obtained by torture. These indirect deaths are cited in studies of the Great Fire by the historians Neil Hanson (The Dreadful Judgement) and Adrian Tinniswood (By Permission Of Heaven). There is also plenty of speculation – for example, the London Fire Brigade states that “it is unknown how many people died in the great fire of London because many more died through indirect causes”, while BBC History claims that “the true toll is likely to have been much higher [than six], rising further in the following months”. 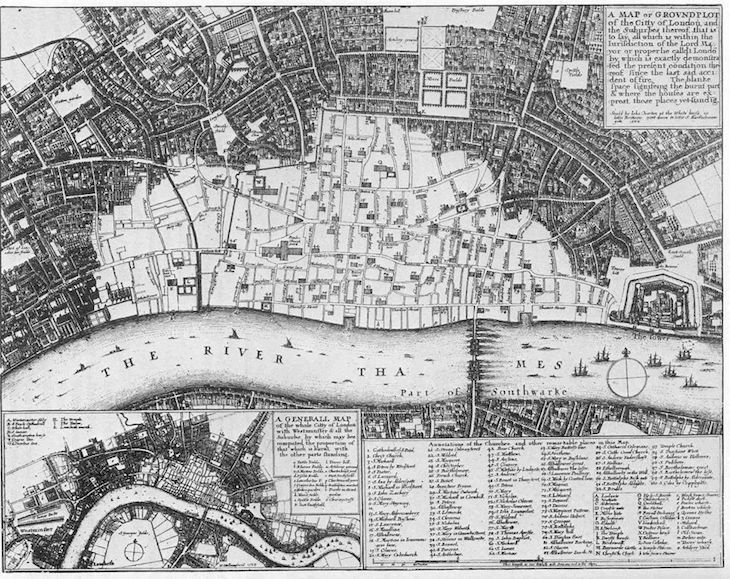 Map by Wenceslav Hollar of the burned area of the City after the Great Fire of London 1666. As the fate of Mr and Mrs Shirley indicates, the aftermath was notable for the number of Londoners who, out of necessity, were forced to live either in the burned-out ruins or in refugee camps that sprang up in the areas which the blaze hadn’t reached. Some would have been injured in the fire, while others were already sick and had been carried away; they would have faced hunger and exposure in the cold autumn and winter that followed. On 7 September, the diarist John Evelyn reported going to “Islington, & high-gate, where one might have seen 200,000 people of all ranks & degrees, dispersed, & laying along by their heapes of what they could save from the Incendium”. It seems unlikely that the Shirleys were the only ones to die in such circumstances. Much of what we know of deaths in late 17th century London comes from official records, most notably a weekly list of death statistics called the Bills of Mortality. Yet in the Great Fire’s immediate aftermath accurate record-keeping would have been impossible. It was not until three weeks after the Great Fire that a Bill of Mortality was published; although this one had a much higher death total than the last one to have been published before the Great Fire, it did cover a longer than usual time period. While many historians accept the low death figures, others are sceptical. The death records relied on solid evidence — such as bodies — and there is a theory as to why there may have been so few counted. The blaze was a firestorm, fanned by strong winds and fed by substances like coal, gunpowder, pitch, spirits and turpentine, wood and thatch, and it reached temperatures far higher than a fire in a single house or row of houses. The temperature was estimated – by archaeological discoveries of melted glass, melted iron and even melted pieces of pottery (as can be seen in the Museum of London) – to have been far higher than the temperature that is required to incinerate a body in a modern-day crematorium (as Hanson remarks). Any bone fragments left behind would have been easily crushed by rubble, or even disintegrated by workmen clearing away the debris. But while we theorise about people who may not have been able to escape, there is evidence that many Londoners were able to get away before their homes burned down. The alarm was raised quickly in the early hours of Sunday, 2 September 1666, and while the Lord Mayor Sir Thomas Bloodworth dithered, many Londoners took immediate steps to ensure the safe evacuation of themselves and anything they could carry. On that day, the diarist Samuel Pepys observed “every creature coming away loaden with goods to save – and here and there sick people carried away in beds … the streets full of nothing but people and horses and carts loaden with goods, ready to run over one another, and removing goods from one burned house to another”. Pepys himself took in a colleague whose house had burned down, and encountered a merchant called “Mr Isaccke Houblon, that handsome man” who was “receiving some of his brothers' things whose houses were already on fire”. 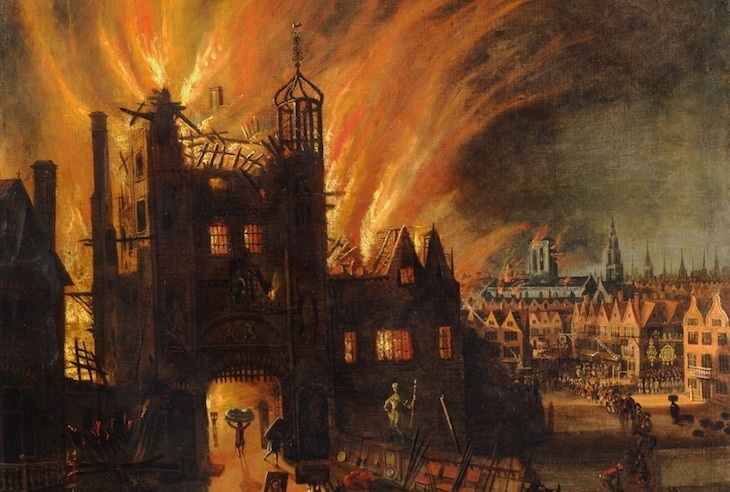 Houblon told Pepys that, even though he was taking in his brothers’ goods, he reckoned that his own house would later burn down as well – which it did. He was able to escape in good time for it is estimated by Tinniswood that the fire itself advanced at an average of just 30 yards per hour over the course of the four days during which it burned. London’s population is estimated to have declined by as much as a quarter in the 1660s, although much of that was due to the Great Plague of 1665 — which killed around 70,000 Londoners — it’s important to see the Great Fire in this context rather than as a standalone disaster. Following the fire, some people moved to unburned parts of London or its surrounding villages, while others moved to other parts of the country or even emigrated to the New World. Few records were kept of such movements; wherever they went, burned-out survivors would have prioritised the finding of food, drink and shelter over finding out what might have happened to friends and neighbours. Those who did return to rebuild their lives in London would have had greater concerns than pondering the fate of those who did not. While it seems hard to believe that the death toll from such a momentous tragedy was low, all of the evidence from the time suggests that it was. Unlike the preceding Great Plague, the Great Fire was seen as a destroyer of buildings and property. Perhaps the most significant death in September 1666 was that of Medieval and Tudor London, which disappeared forever beneath what Pepys described as “one entire arch of fire … an arch of above a mile long”. It is highly likely that there were unrecorded deaths; Tinniswood, who puts the death toll “in single figures”, adds that there must have been deaths that went unrecorded, especially afterwards. Hanson, by contrast, cites “common sense” as a reason for believing that the death toll in the blaze itself was much higher — “several hundred or quite possibly several thousand” is his estimation. The likelihood of there being people whose deaths went unrecorded – in the blaze itself as well as in the refugee camps afterwards – means that, in answer to the question ‘is it true that only six people died in the Great Fire?’, we must say ‘no’.